A rude awakening: Now that we’ve grown into a great big city, it’s time to pull out some grown-up manners. Seattle, it’s time we talked. You’re not a kid anymore. People have lived in your footprint for thousands of years. But your recent growth spurt has been phenomenal. You will start to notice some changes, if you haven’t already: some of them terrifying, some of them delightful. You’ll feel things you never felt before. You’ll start hanging out with a faster crowd, and they won’t always be good for you. With great change comes great responsibility, to paraphrase Marvel Comics. And it is time to take on some of that responsibility. It sounds daunting, but remember: We love you. C’mon, Seattle. You’re growing into a big city. It’s time to start acting like one. THINK OF THE city’s situation as your first day of kindergarten, or arriving on campus at a big college, or leaving a small family business to work at a big firm. Suddenly, you’re surrounded by others. Every time you turn over on your nap mat, somebody’s feet are in your face. There’s a line for lunch, then a line at the milk cooler, then a line to turn in your lunch tray. Years later, you’re crammed into a shoebox-sized dorm room at night, and in a lecture hall of 200-plus every Monday, Wednesday and Friday. Seattle is that transition writ large. Between 2008 and 2017, our Emerald City added more than 100,000 people. It’s as if the entire population of Everett decided to move here in nine years. And all those people need space for their nap mats. The blame is often assigned to social media and the short attention span it breeds, which in turn makes people unable to wait in line, let others go first, read books with big words or sit through all four nights of Wagner’s “Ring” cycle. Seattle natives like to place technology-adjacent blame on Amazon, Amazon employees, Amazon’s two-hour delivery, Amazon Go, Amazon Prime, Amazon Prime Now, Amazon Fresh, Amazon’s free bananas and the Amazon Spheres. Seattle cannot sprawl. Buildings have to be built closer together, and because they can’t get wider, they get higher. The roads and the sidewalks don’t get any wider, either. There certainly aren’t any more parking places for the people moving here. The bus stops that were placed just a few years ago were for a handful of people, not the crowds of 50 to 75 that jockey for space. This is “density,” and Seattle, you’re just not used to it. I’M LOOKING AT YOU in particular, South Lake Union. A decade ago, a pedestrian was more likely to encounter rats and liquor bottles on the sidewalk than another person. Since then, Amazon added nearly 35,000 jobs, most of them in SLU. Now, the area is bustling with throngs of employees and their dogs; food trucks serving lunch to the employees and dogs; Ubers and Lyfts dropping off and picking up; cranes to build more high-rises; and construction workers trying to flag, drive and walk. The maze of streets that used to pass empty parking lots and shuttered commercial laundry buildings is carrying Ubers, Lyfts, buses, dump trucks and commuters. (Wait until Amazon reaches its goal of enough office space next decade for 55,000 workers. Does the plan say anything about where these people are going to fit amid closed-off streets and sidewalks? Doubt it.) It’s as if a giant vise had the city in its jaws and was slowly squeezing. And the people caught in it — all of us — are forced to get closer to one another. Are we midtown Manhattan? By no means. The New York Times’ excellent 2016 article about sidewalk congestion noted that on one weekday, 26,831 pedestrians used a stretch of Fifth Avenue in three hours. However, the same article notes sidewalk crowding on Capitol Hill in Seattle. We’ve made the big time — kind of. We have to take notice of others. There are so many of us now. Gone are the days when you could jump on the first bus that came by for your route and grab a seat, or go to Pike Place Market without dodging mobs of visitors and a stream of drivers who insist on motoring through the city’s most crowded thoroughfare. Driving I-5 south on a Friday night usually involves tears. I’m not aiming this solely at residents; visitors, you need to adjust your expectations, too. If you haven’t been here in a while, this isn’t your mom and dad’s Seattle. The Kingdome is gone. Teslas are everywhere. Speaking of cars: Their numbers in the city have grown by about 1 jillion. (Well, OK; not a jillion. But, the number of car registrations grew by 7 percent between 2013 and 2015, while population grew just more than 2 percent, which was kind of a surprise.) Get it? Seattle is a big city now. The squeeze really starts to pinch in places where we’re all thrown together a little more than we’re used to. Mainly, jammed public transportation, the region’s congested freeways and public thruways. This might be a little hard to swallow, Seattle, but frankly, you could do a little better when it comes to sharing the space you’ve become accustomed to over the years with a lot more people. And newcomers, there’s an awful lot of you all at once, but you’ve still got to share with those who were here already, no matter how many of those high-rises were built just for you. For the love of all that is holy, take off your backpack on crowded trains and buses. 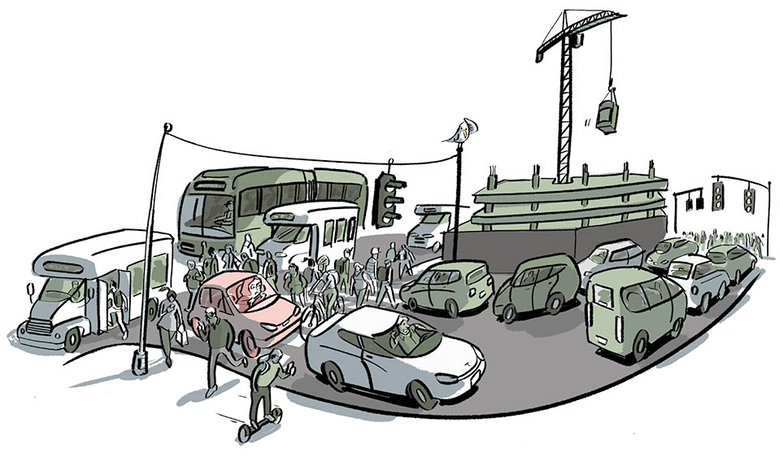 I will make this as simple as possible: More people are using transport. More people need to get on and off quickly. You can fit more passengers comfortably on a bus or train if you are not carrying supplies for Everest on your back. Also, when you’re kitted out like a bipedal turtle, you’re bound to whack seated folks in the head. They don’t like this. True story: I was clinging to the grab bar on a somewhat crowded E bus one evening, right behind the bendy part. A man in front of me had a large backpack on and kept bumping the passenger seated behind him. Passenger tried to get his attention. Didn’t work. He tugged on the backpack several times. Mr. Backpack finally turned around. Passenger told him — in, shall we say, an impatient tone — to take his (expletive) backpack off. Mr. Backpack took offense at this, and verbal wordplay followed. Not wanting to get decked once fists started flying, I kept inching back. (Regular E Line riders, you know this maneuver.) Finally, Mr. Backpack told Passenger that he was ready to take it outside at the next stop. Now, there were two upsides to this: If they got off, I would get a seat. Plus, Passenger was bigger than Mr. Backpack, so there would be a tiny bit of vicarious revenge, if not served cold, then at least chilled. However, they simmered down, and Mr. Backpack stomped to the front of the bus, whacking several people as he marched. All of this could have been avoided had Mr. Backpack taken a moment to be considerate. It can’t be that hard. People want to get home. You are preventing these things. Why? Blood pressure citywide would plunge if everyone could drive less. Not happening. With home prices on a tear, lots of newcomers have to live somewhere else if they’d like things like groceries. Again, this puts more people on the road. And again, you need to pay attention. My colleague Ron Judd has expounded with great skill on the phenomenon of left-lane campers, so I’ll leave that in his expert hands. But two things in Seattle confound me, and seem to be a throwback to congestion-free, roomier times: drivers who leave three or more car-lengths between them and the car ahead at a stoplight, and those who have not mastered the skill of merging/changing lanes, and stop until enough vehicles pass to allow them to inch over. A friend whose dad was a native Washingtonian once commented that her father had this peculiar habit of just stopping on the roadway whenever he couldn’t figure out where to go. I thought: “How weird! Who does that?” Now I know. Sidewalk hogging is reaching a boiling point. If you Google “sidewalk hogs,” this post takes the temperature: “Sidewalk hogs: Things I want to punch in the face.” Susan Kelleher wrote about pedestrian rage for this magazine. 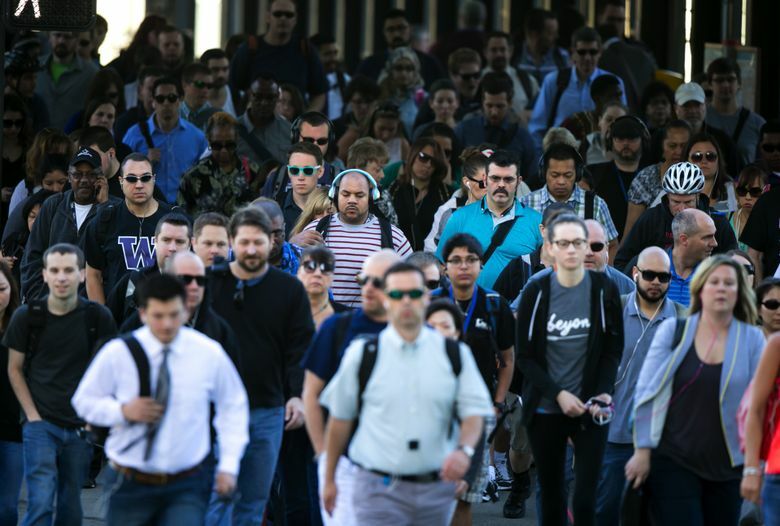 And Seattle Times reporter Christine Clarridge, after hearing plenty of co-workers gripe, wrote a piece on sidewalk etiquette — badly needed here, believe it or not, in polite Seattle. And it didn’t work, so here we are. Big, growing cities mean crowded sidewalks. That means there are more people to consider. But Seattleites, you’re not considering. You continue to walk as many as four abreast. Or you’re walking straight down the middle of the sidewalk, gazing at your smartphone. A loud “excuse me” goes unnoticed. The solution to this is so easy. It’s just like driving. Travel on the right; pass on the left. Leave the left “lane” open for faster foot traffic. Seattle, why can’t you do this? Sometimes dogs can be hogs. More accurately, their owners are. Those retractable leashes that let dogs run as much as 16 feet ahead of their owners? Fully extended, those are for the park or the woods or wherever there is lots of space. There is not lots of space in the crosswalk at Westlake and Denny. And again, not a lot on the sidewalk. So mind your leash and your incredibly cute corgi, before one wraps the other around someone’s ankles. It’s hard to be mad at a corgi. That leaves you. OFF THE SIDEWALK and out of the intersections, consideration does pop up, like a prairie dog or a bird long thought extinct. In a spasm of stupidity last fall, I jammed my cellphone and case into my coat pocket and didn’t zip it all the way. My phone jumped out of my pocket, as phones are wont to do. Someone took the time to return it with everything — credit cards, driver’s license — intact. That’s a miracle I probably didn’t deserve. Everyone went away smiling. We were a small town and a city all at once. Melissa Davis is The Seattle Times’ A1 editor. Seattle Sketcher Gabriel Campanario illustrates life in the Puget Sound region.